Detailled instructions on how to configure and use Apwal are available in this Linux-Magazine article: Application on demand with Apwal program launcher. The 'Application Property' frame allows to modify the application currently selected. 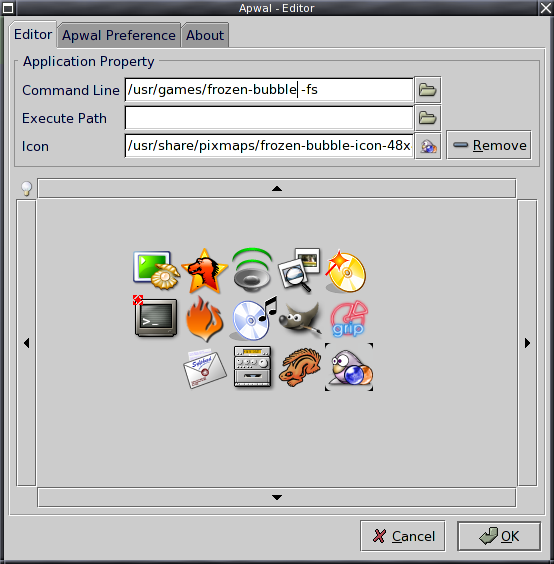 It is possible to move the application icon by drag and drop on the editor bellow. A double clic on an icon will show the Icon Selector. It could be showed in a separate window or in a tabulation of the main window (Cf. the 'Apwal Preference' tabulation to set this option). 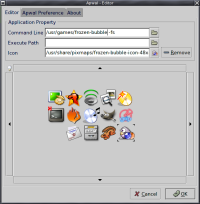 The 'Filename Filter' entry allows to apply a filter on the list of loaded icons; wildcards are allowed (Ex: 'gnome*'). 'All Icons' Button resets the filter to '*' in order to show all the loaded icons. Defines the icons which are going to be loaded and accessible in the Icon Selector. Few filters are available like the file extension or the icon resolution. 'Pixmap Path' lists the paths which are going to be scanned. All icons found in this directories which satisfy the previous criterias will be loaded in the Icon Selector. 'Sel' allows you to unselect a directory without having to delete it. 'Rec' starts a recursive scan. Be wise... don't launch it on '/' unless you have some time to spend. If 2 paths cross each other the parent will stop its recursive scan at the child directory location.